Discount retailer B&M has announced a positive result in revenue despite purse strings tightening and high street retailers struggling to keep afloat. Income at B&M European Value Retail S.A. for the 53 weeks to 31 March 2018 was £3.03bn compared to £2.43bn for the previous 52-week period. Group revenues increased by 22.4% to £2,976.3 million. 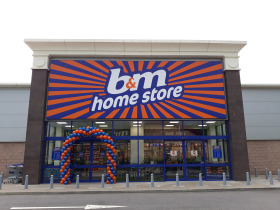 B&M UK has reported positive like-for-like revenues with an increase of +4.7% and expansion plans are confirmed with 47 gross new B&M store openings in the UK. B&M has sought a new warehouse investment in the UK, where the company has acquired land for 1,000,000 sqft warehouse in Bedford at a cost of £44 million and the build and fit out costs over the next 18 months is expected to be c. £65 million. Chief executive Simon Arora said: "B&M has delivered another set of strong results by doing what we do best, which is providing great value week-in, week-out on the things customers buy regularly for their homes and families. "The B&M model is highly relevant for the current difficult economic environment, with its strong position in the value and convenience areas of retailing where physical stores are winning. "The business is well placed for continued profitable, long-term growth. In a retail sector beset by structural challenges B&M's unique, disruptive model stands out as a success story."